As promised, I watched the film DALE and was enraptured. This is no Hollywood flick with aggrandized plotlines...it doesn't need to be. 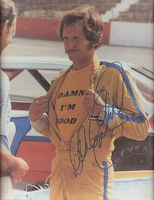 Dale Earnhardt was the real deal, and his life was worth celebrating without an ounce of embellishment. What struck me so hard was the simplicity of his message and his focus. Race for life, race for fun, and race to win. If you tried hard to recreate what he established as a legacy, it would be impossible. His legend is really the kind of story that can only be created from the heart of a driven man (no pun intended). From 1979 "Rookie of the year" to 20 years of trying to win Daytona, and finally emerging victorious in 1998, Dale kept it real chasing every single goal that motivated him in the automotive racing world. He would have believed in Local Motors, and we would have been honored to have him as one of our customers. Yet again another great reason to visit North Carolina...these types of reasons seem to be on my mind a lot these days. Keeping in mind the end goal to spruce things up with its most well known offspring, Hero has presented various overhauls in the iSmart. The unmoving stop-begin framework, known as the i3S, moderates fuel by closing the motor while the bicycle is sitting out of gear and kicking it move down when the bicycle is gotten under way..